Julie Taylor is an eLearning Specialist at WIDA. As an instructional designer, her focus is on the design and development of online learning for educators. She designs and manages these projects to bring about creative, innovative resources with educator perspectives. This coordination of online and blended learning projects has helped WIDA expand their educator offerings. She started her career as an educator, spending 22 years teaching multiple grade levels in Special Education with an emphasis on Reading and Language. 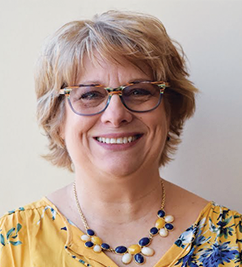 After teaching, she worked at an educational publishing company designing professional development master’s degrees and graduate courses for educators. The courses involved distance learning, face-to-face, online, and video-enhanced products to exhibit best practices in education. Prior to this, she worked with a government consulting company, creating adult training programs for many departments of the U.S. Federal Government. Julie holds two master’s degrees, one in Reading and the other in Instructional Technology with an emphasis in instructional design. Her bachelor’s degree is in Education with a K-12 emphasis in Special Education.